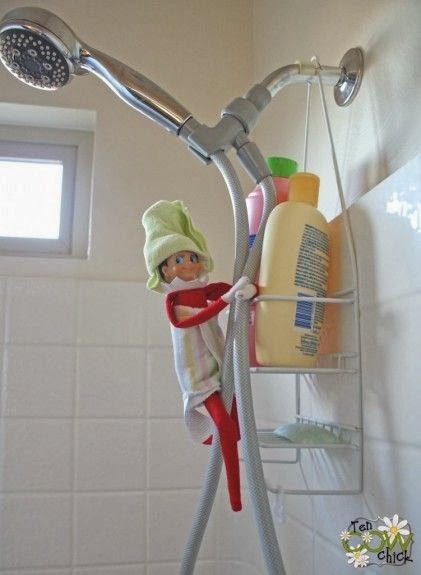 How did the elf hiding go this week? 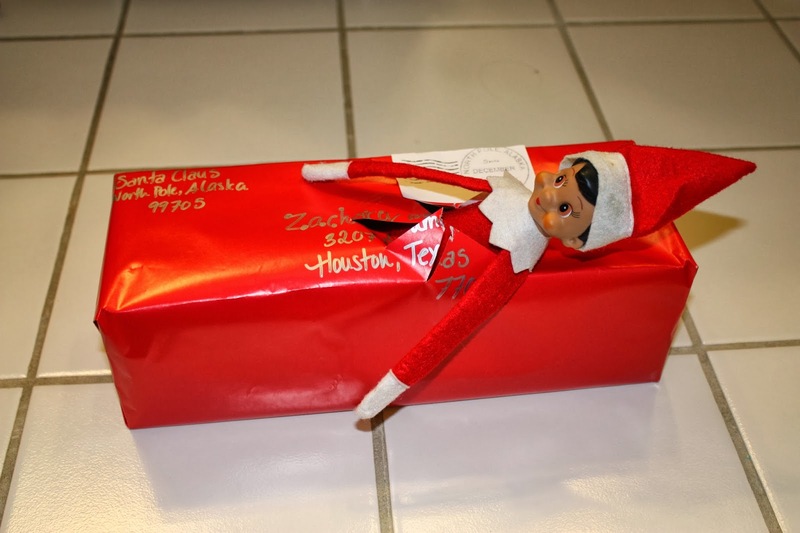 Did your kids love the elf angel with sprinkles? Did you love cleaning up the mess it made? Thought so. I know you all so, so well. Was my cheat sheet helpful or did you branch out? I would love to see what other people did! Please comment or email me so I can share them here as well (if you like). You guys remember our elf Jack, who moved in last December. this year I started out strong with Alex placing Jack on the front porch (not on the bathroom floor as in the picture above) and then sprinting to the back of the house. It was Sunday, the mail doesn’t come on Sunday – who could have sent it? Zachary lost his mind when he saw him. He screamed JACK IS HERE! and ran to the back of the house to yell it at his dad. James was, of course, running along with him but completely unsure as to why we were yelling about a doll in a box. The next day Jack was found, by Alex, in one of his socks sleeping. 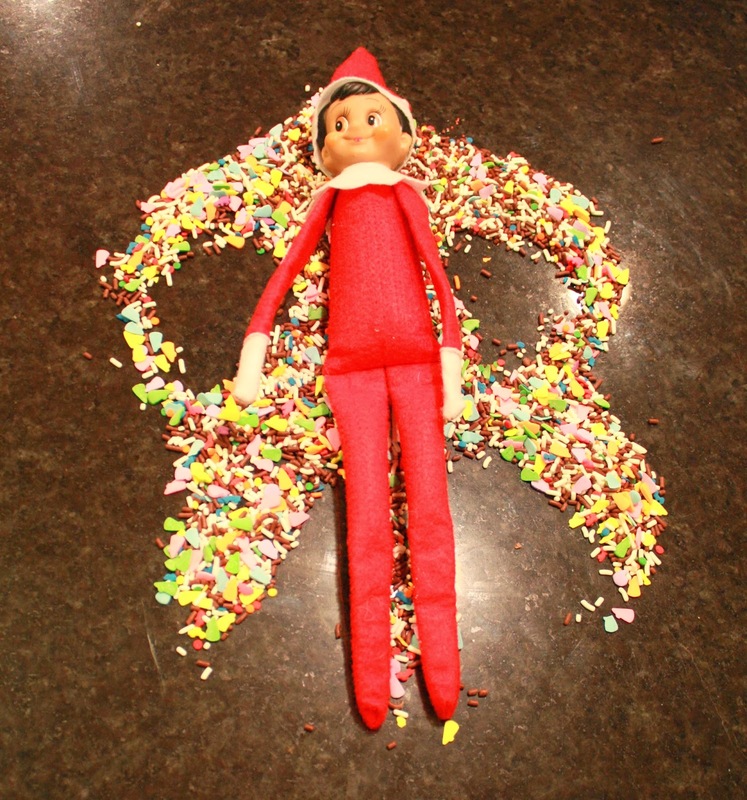 Tuesday I got lazy and just put him on top of a candle holder and Wednesday he made an elf angel out of sprinkles. At first I was a tad annoyed to use perfectly good sprinkles but then I checked the expiration dates (who knew they expired?) and found I had plenty that needed to go. 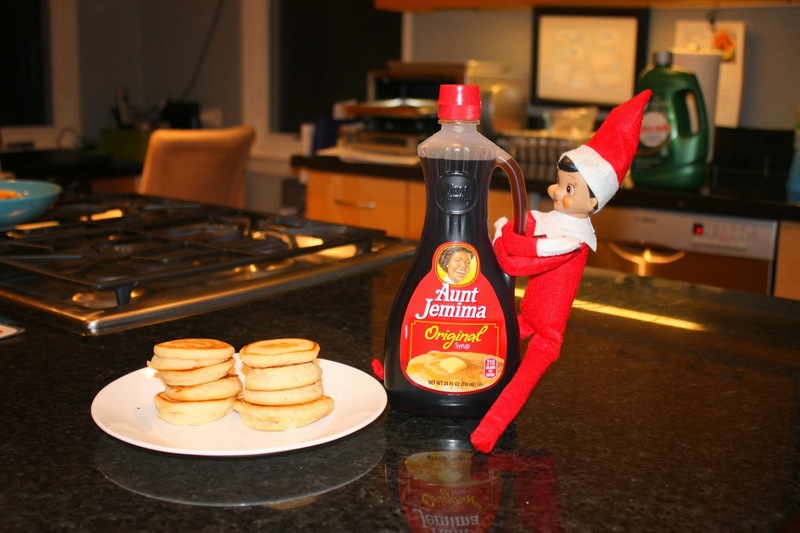 Thursday Jack made mini-pancakes for the boys and attached himself to the syrup. Wednesday night I finally added the wire to Jack so he could hold on to things and had feet. Super easy and worth it, PS. Today he was found under a glass as I was making breakfast. Zach was highly concerned about his ability to breathe in there. What is on the schedule this week you ask? I know you are just dying to know. Here is Week Two complete with your printable file. 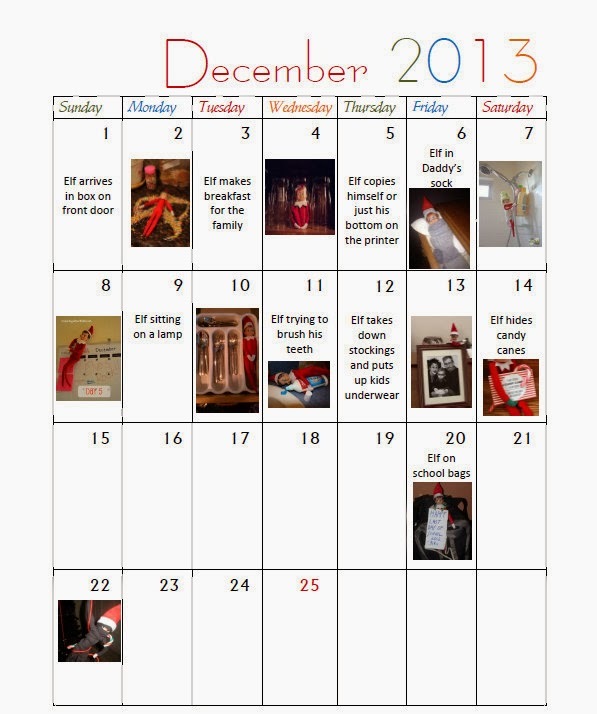 Sunday December 8, Elf is hanging on your calendar and has scribbled graffiti all over it! 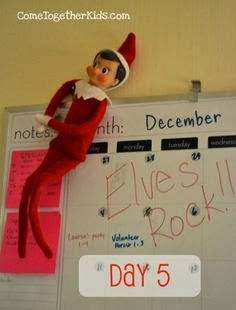 Monday, December 9, Put the elf on top of a lamp in your child’s room. 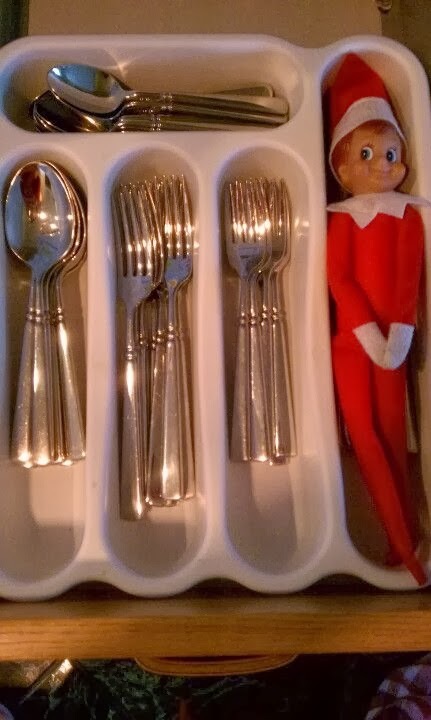 Tuesday, December 10, little hands can find the elf when they get their spoons for cereal. Thursday, December 12 and my favorite, the elf takes down the stockings and puts up your child’s underwear in their place. Put the elf on the mantel holding the stockings. 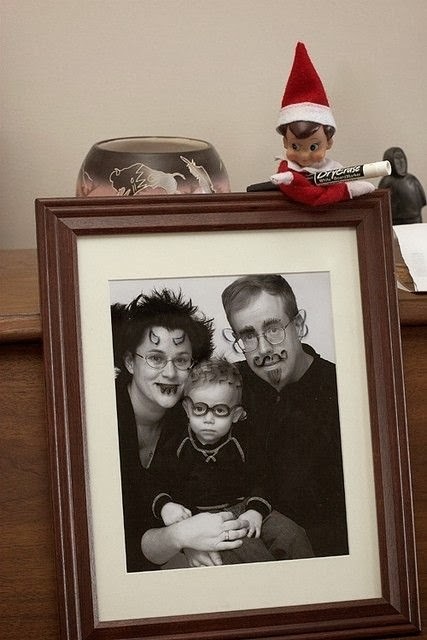 Friday, December 13, Use a dry erase marker for the elf to draw funny faces on a family photo. 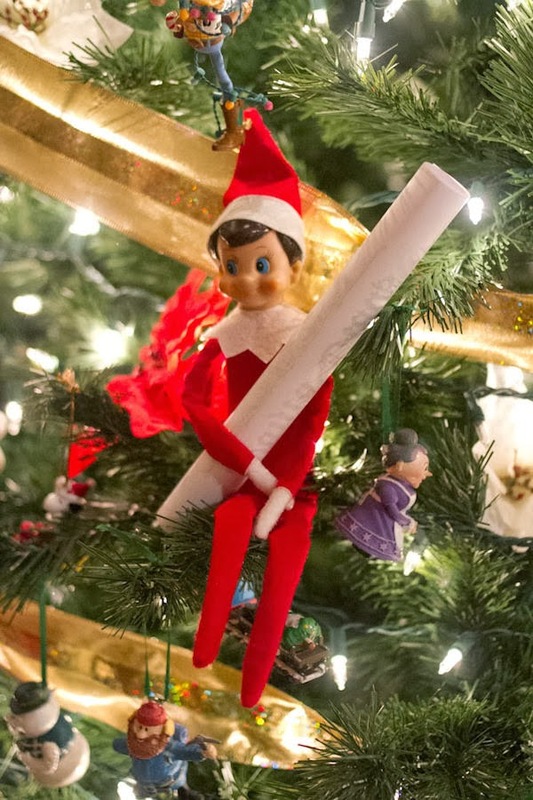 Saturday, December 14, Elf hides candy canes in your child’s room for him to find. Here is the printable file from Etsy, or you can just write it out yourself. 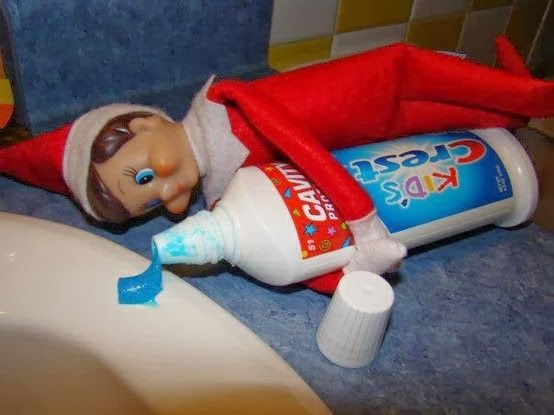 I have had a couple conversations about what happens when we forget to move the elf. Because it is going to happen. I just turn to my children and say, “Well, what did you do that Jack didn’t want to tell Santa?” They have always done something; hit their brother, talk back to us, wrestle at school, etc. And they are always better the next day. I also spotted this suggestion of a note from Santa after you have had a particularly bad day. I love it and will most likely be using that at least once, if not twice. While my boys love Jack they don’t respect his authority. « The elves are coming! The elves are coming!